A Shackleton statue in London. Episode: 56. Site Number: 007. Date Posted: 9 January 1998. Update 16 March 2000. Location: Exhibition Road at Kensington Gore, London, UK. Type: Public Art. Captain Scott statuary abounds but I know of only one Shackleton example. Fortunately, it's as good as public art gets: skillfully done and like the man himself, powerful and bold, larger than life. 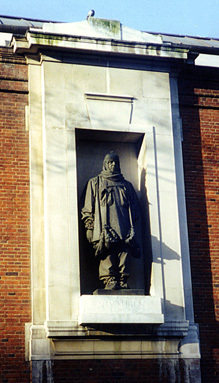 Sir Ernest, dressed in polar sledging gear, stands there, high up in his niche, staring intently out over Exhibition Road to the distant horizon of Knightsbridge! 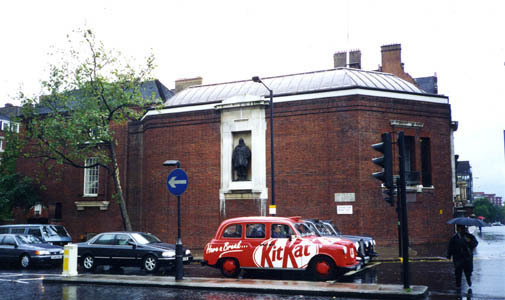 Today is the 89th anniversary of the 'Furthest South' of Adams, Marshall, Wild and Shackleton (97 miles from the Pole) and the 66th anniversary of the unveiling of the statue on the facade of London's Royal Geographical Society. Sculpted by Charles Jagger, apparently after designs by the great architect Sir Edwin Lutyens, the bronze heroic figure was unveiled by the Marquess of Zetland, Chairman of the Shackleton Memorial Committee. A note in the Geographical Journal (v 79, no 2) relates the interesting observation that "those who had...the privilege of seeing the clay in the sculptor's studio were able to admire his treatment of the picturesque sledging kit and his skill in finding a convention for representing fur in bronze." Update 16 March 2000: The speeches at the unveiling are recorded in the March 1932 number of the Geographial Journal (v 79, no 3). Included are those by Dr Hugh Robert Mill, The Marquess of Zetland and Admiral Sir William Goodenough.